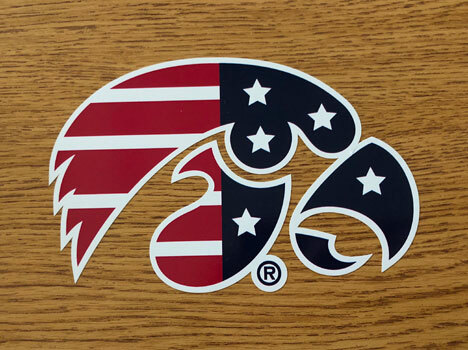 Out latest addition to the Iowa Hawkeye Vinyl Decal family is the University of Iowa's Patriotic Collection. Available during limited time frames - May 1 through July 4 and October 1 through December 24 covering all patriotic holidays. Celebrate in style with one of our decals from this outstanding Patriotic Collection. Shown in red white and blue, is the University of Iowa Tigerhawk, Iowa's own logo.